NEW YORK, NY--(Marketwired - Mar 8, 2016) - Counting Parrots, a new educational math app for kids by Yingele, announces today that a research from the University of Missouri supports the educational app by suggesting that teaching preschoolers to actually count numbers, not just recite them, will better prepare them for success in math once they start school. The app is available for download with two versions: free and extended for $5.99 on the App Store, Google Play and Amazon. Counting Parrots app by Yingele, provides a fun, entertaining rudimentary mathematics learning experience for children ages 3-7. Through the game, children learn to count to 20, associate numbers with quantities, practice patterns and grouping, understand simple equations, and strengthen fine motor skills and memory. Throughout the game, the children have a goal - they must teach the parrots to fly by different counting activities. Each time they play, they get a different combination of experiences, and the games increase in difficulty as they progress through the series. Louis Manfra, an Assistant Professor in MU's Department of Human Development and Family Studies says, "Counting gives children stronger foundations when they start school... When they're counting, they're performing a more cognitive activity in which they're associating a one-to-one correspondence with the object and the number to represent a quantity." Manfra added, "The skills children have when they start kindergarten affect their trajectories through early elementary school; therefore, it's important that children start with as many skills as possible." The research discovered that kids who could recite and count to 20 in preschool had the highest math scores in 1st grade. However, less than 10 percent of the children in the study could count and recite to 20, according to the University. 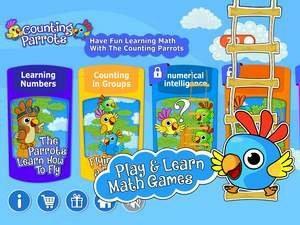 Yingele CEO, Yosi Bloomshtein noted, "This research backs Counting Parrots game educational goal - to provide toddlers with the mathematical foundations they need for first grade, along with entertaining format and colorful parrots, kids really enjoy to learn math." Yingele is a company who specializes in creating early childhood educational games, amongst the "Counting Parrots" game, with 25 years of global experience. Its approach is firmly rooted in the philosophy that creating a fun environment is the first step in sharing the joy of learning. All of Yingele's products are based on the latest educational and psychological research on the acquisition and development of language and numerical skills. Yingele founders, Joseph Bloomshtein and Michael Becker, bring years of experience creating dynamic game-based learning to their apps. Bloomshtein developed numerous educational games, including some for the Sesame Street workshop. Becker is a professor of linguistics at SUNY Stony Brook and earned his PhD from Harvard University.